All in all, everyone had a great time reacquainting with old friends and also making new ones. 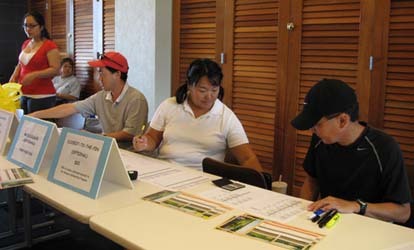 Many thanks to our host, Kapolei G.C. and all of our volunteers (see below) for organizing our event and special thanks to all of our generous donors (see below). Most of our proceeds and donors go back into the tournament, however, whatever is in excess does towards our scholarship program. Don't forget to sign up early next year...space is limited! Hope to see you all next year! Early morning registration (left); lunch before golfing (right). DONOR ACKNOWLEDGEMENTS: Aloha Gourmet Products (Daren Lum), Aloha Petroleum (Alton Higa), Ameriprise Financial Services, Inc. (Eric Fujimoto), Anheuser Busch (Tracy Mori), B. Hayman Co. Ltd. (Al Kakazu), Bank of Hawaii (David Chung/Kevin Higa), Chambers & Chambers (Sky Cameron), Cornerstone Educational Svcs. 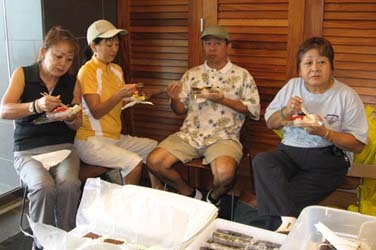 (Lissa Goya), Frito-Lay of Hawaii (Damon Ng), Ground Floor (Scott Awakuni), Hawaii Candies & Nuts/Menehune Mac (Gale Taira/Neal Arakaki), Hawaiian Air Cargo (Brian Suzuki), Hawaiian Building Maintenance (Karl Fujii), Hawaiian Dredging Construction Co. (Sheila Uehara/Cheryl Arii), Hawaiian Natural Water Co. (Clarence Sakamoto), Hawaii United Okinawa Center (Jane Serikaku), Hui Makaala of Hawaii, Island Air (Les Murashige), Ito En Hawaii (Eric Nakasone), Kapolei Golf Course (Ken Terao, Pro), Laser Eye Center (Jan Toma), Momentum Designs (Camille Takushi), Oahu Care Facility (Randy Ito), Off The Wall (Grant Murata), Pacific Telecard (Todd Nakatsukasa), Paradise Beverages (Craig Nakatsukasa), Partners in Development (Karen Shishido), Pearl City Nursing Home (Bernie Ledesma), Positive Electric (Dean & Lisa Shishido), Roots & Relics (Keith Tanaka), Shiroma’s Wine and More - SWAM (Jill Shiroma), Side Street Inn (Earl Kalani), Tamashiro Market (Cyrus Tamashiro), Tamura Super Market (Cliff Tamura), Yamasato Fujiwara Higa & Associates (Lloyd Higa), Jennifer Waihe`e, Karen Shishido, Laverne Higa, Mino & Patsy Takaesu, Mark Fukeda, Keith Ushijima, Rena Takushi, Sandy Goya, and Val Kato.